What is true in the Mid-Atlantic region of the US holds true for Cyprus as well: Spring is prime-time for Passerines. They’re just so easy to hear and to see that now, with how they advertise themselves with their songs and vibrant plumages, they sometimes give the impression of being more numerous than in Autumn. These include Warblers, Wheatears, Flycatchers, Buntings, Shrikes, Wagtails and Larks. My personal favorites though are the Wheaters. While Finsch’s Wheatear over-winter in Cyprus, Isabelline Wheatears are the very first to arrive among the Spring migrants. While a handful may arrive weeks early, their migration begins in earnest about a week into March, and the majority of Isabellines pass through in the second half of March (now!). This species is not only usually the earliest, but the most common. At their peak, one can easily see two dozen in a short day of birding! Northern Wheatear are abundant here as well, coming only a few days (if at all) after the first big rush of Isabellines. What’s remarkable about this species is what we don’t see here: the extremely long migration that this species makes, with some individuals traveling from Sub-Saharan Africa to Greenland and back every year. Black-eared Wheatear passes through in slightly smaller numbers, with the main migration taking place in the last week or so of March each year. Birders from Western Europe will surely note, upon seeing Black-eared Wheatear here, the difference between this Eastern race and the Western race that they may have seen in Spain or France. Much less common is Desert Wheatear, which is usually only seen in ones and twos, and again following the first big rush of Isabellines, until early April. Similarly to the Black-eared Wheatear, there is a subtle difference between the Western race, and the Eastern race which we get here as they pass toward the semi-arid regions of central Asia. And then of course who could forget the Cypriot endemic, the Cyprus Wheatear. It was long thought to be merely a subspecies of Pied Wheatear, which we now know to rarely if ever visit Cyprus. The split came in the early 1980’s, when it was recognized that the Cyprus Wheatear was sexually dimorphic, unlike Pied, and that their two songs don’t resemble each others’ in the slightest. The first wave of this species will typically arrive in mid-March, and I find this bird to be quite a treat for my neighborhood, as in each year since I moved to Cyprus there has been at least one pair that sings within range of my flat. While this species arrives as early as mid-March, the neighborhood pair has arrived a full month after that, and it will then stay until as late as October. That’s 6 regular Wheatears that you should see in Cyprus every year, not counting vagrants, out of 22 recognized species worldwide. 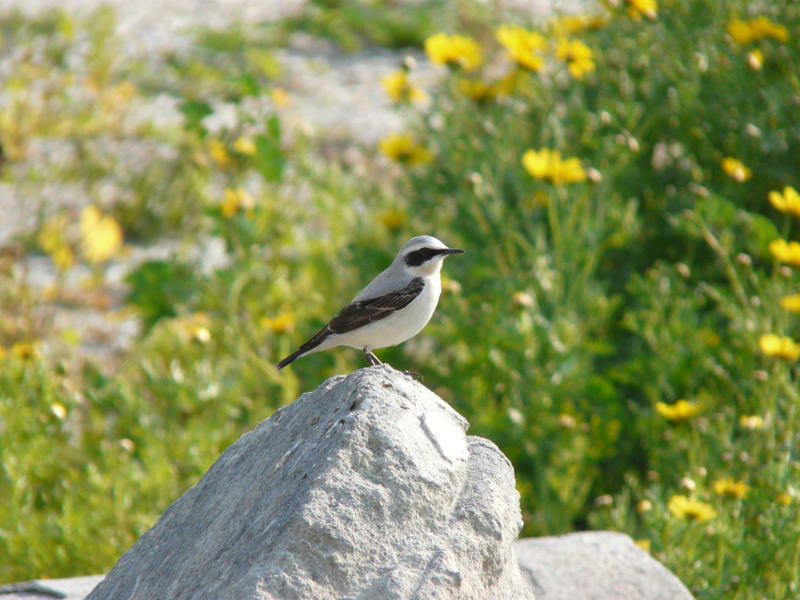 Photo: A Northern Wheatear at the Paphos headland, taken by Jane Stylianou on March 15, 2011. I got to experience a wheatear-palooza on my one day birding around Dubai last year. Migratory Isabelline, Pied and Red-tailed Wheatears along with a non-migrating Hume’s Wheaterar!